For sale with NO ONWARD CHAIN, this SPACIOUS house will make a great family home and is FREEHOLD. 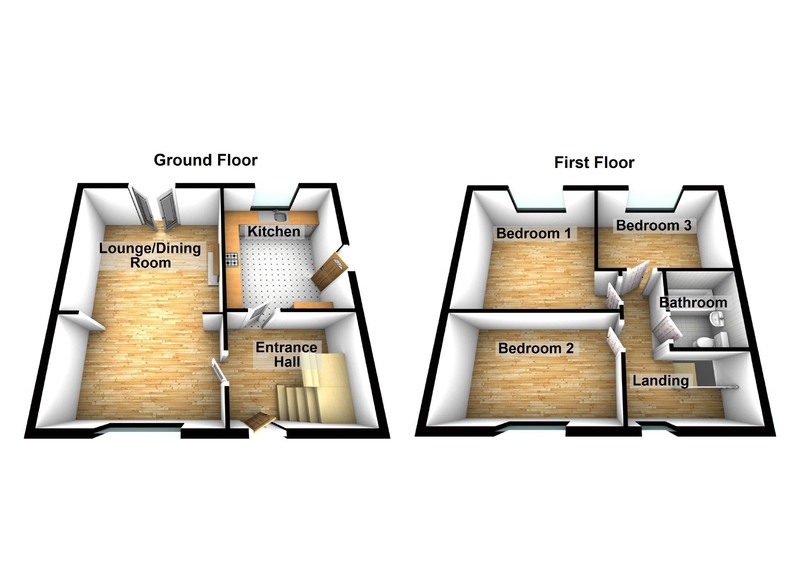 There are THREE DOUBLE bedrooms and a very spacious kitchen, as well as DRIVEWAY parking, there are gardens front and rear. For those with children, Temple Memorial Park is close by and there are "Good " and "Outstanding" schools locally; Biddick Hall Junior School is less than 1/2 a mile away and a just a little further there is St Wilfred's RC College providing secondary education. There are two METRO STATIONS a little over 1/2 mile away and road links to the A19 are close by. Council tax band A, Energy Rating D. To arrange a viewing call next2buy Ltd on 0191 295 3322. Entrance Hall - UPVC double glazed entrance door. Return staircase to the first floor. Doors lead to the lounge and the kitchen. Radiator and laminate flooring. Lounge And Dining Room - 6.50m x 4.06m (21'4" x 13'4") - A spacious living area with ample room for lounge and dining areas. Modern wall mounted electric fire. Double glazed window to the front. Double glazed French doors to the rear. Radiators. TV point. Kitchen - 3.78m x 3.18m (12'5" x 10'5") - Fitted with a range of wall and base units. Integrated electric oven and gas hob with extractor hood above. Sink unit. Space and plumbing for a washing machine. Part tiled walls. Double glazed window to the rear. Radiator. Door to the side. First Floor Landing - Doors lead to the three bedrooms and the bathroom/WC. Double glazed window to the front, and loft access. Bedroom 1 - 3.76m x 3.61m (12'4" x 11'10") - Double glazed window to the rear. Radiator. Bedroom 2 - 3.68m x 2.26m (12'1" x 7'5") - Double glazed window to the front. Radiator. Bedroom 3 - 3.99m x 2.67m (13'1" x 8'9") - Double glazed window to the rear. Radiator. Bathroom/Wc - 2.31m x 2.03m (7'7" x 6'8") - Fitted with a white suite comprising; panelled bath with shower above, low level WC and washbasin. Radiator. Part tiled walls. Externally - There is a lawned garden to the front and a gravelled area for off street parking. To the rear there is a patio area and a lawned area with a fenced boundary and gated access.